Since the unpacked event at the end of February Samsung has kept the Galaxy Fold strictly under lock and key, nobody was allowed to touch the star piece. Fear of failure or just an important precaution? One couldn't help but wonder if they had something to hide. But now the first hands-on videos are now here, and they show a fascinating piece of technology. The Samsung Galaxy Fold will be available at the end of April in the US and Europe. So far, only a handful of US media channels were allowed to test the smartphone. 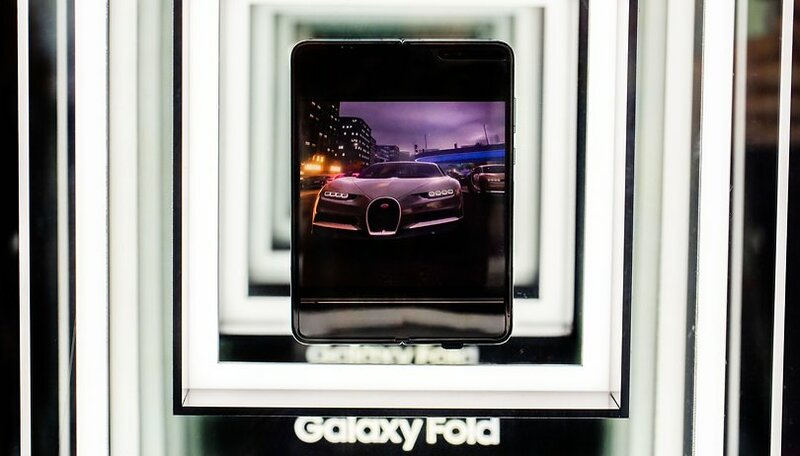 In fact, the Galaxy Fold seems to radiate a fascination and mystique that has become rare in the smartphone market. US YouTuber Marques Brownlee, also known by his abbreviation MKBHD, observed some details during his hands-on with the Galaxy Fold that were not known until now. A raised frame extends around the huge notch and separates it from the display. The wipe gesture for the notifications cannot be used at this point. Also interesting: the magnets in the closing mechanism of the Galaxy Fold are so strong that you can't open the smartphone with one hand. The fingerprint sensor is also the Bixby button, which should give the Samsung Assistant quite a few unintended activations. It will be exciting to see how quickly app developers adjust to switching from a small to a large display. Dieter Bohn of The Verge was initially skeptical after the Galaxy Fold was introduced as to whether the folding smartphone would actually be suitable for everyday use. After trying it out for the first time, the tech veteran is now quite taken with the Galaxy Fold. Like most testers, Bohn concludes that what Samsung presents here actually does feel like the future of the smartphone. In the video from the Washington Post, the editor examines which things are particularly striking, exciting or curious in the Galaxy Fold - and at the end he finds ten points about the folding smartphone, which are discussed in the video. Michael Fisher alias Mr. Mobile, like his colleagues, comes to the conclusion that Samsung has delivered a very special smartphone with the Galaxy Fold. The fact that there is a noticeable crease in the middle of the display doesn't bother Fisher or his colleagues, because this crease is hardly noticeable when it's right in front of you. What do you think of the Galaxy Fold after watching these videos? still seems klunky with an unispired UI.